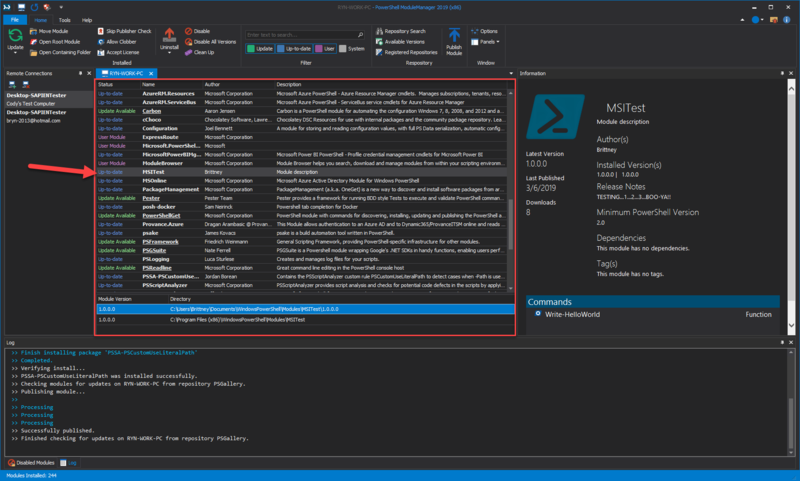 PowerShell Modules are an important resource for scripting, and the ability to share PowerShell modules is easy with online repositories like the PowerShell Gallery. We added the ability to publish PowerShell modules to the latest service release of PowerShell ModuleManager (v1.1.1). You’re welcome! The Publish-Module command—from the PowerShellGet module—allows you to share modules from your local computer to online or local galleries. To run the Publish-Module command, you can either specify the name or the path of the folder containing the module. If publishing by name, the first module found in the paths of the PSModulePath environment variable ($env:PSModulePath) will be published—so it is important to specify a minimum version if you have multiple versions. When publishing modules to a NuGet-based online repository like the PowerShell Gallery, an API key is required. 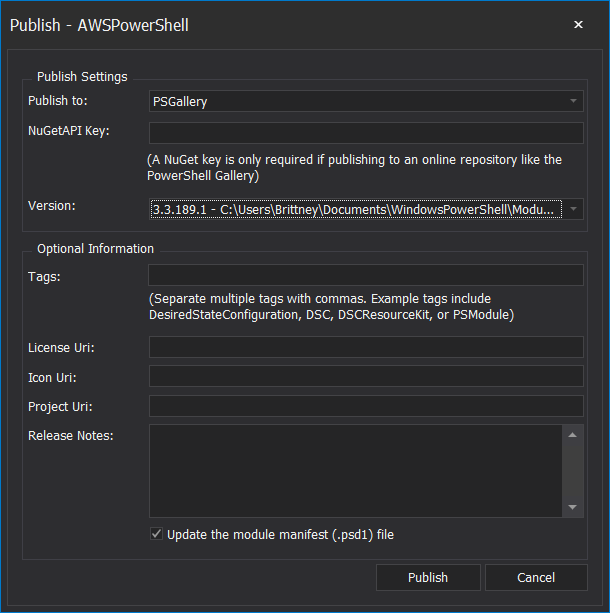 To get an API key for the PowerShell Gallery, you will need to create an account on the PowerShell Gallery and generate a new key for this module package. Local repositories do not need a key. By default, Windows 10 ships with an old version of PowerShellGet, which provides the Publish-Module command, so this module must be updated to recognize the API key from the latest gallery site. Name: Unique name of module that does not already exist on the repository attempting to publish to. Version: Current version of the module that must be higher than any existing versions of the module present on the repository. Description: A short description of the module. Author: Creator of the module. There should be no output if the Publish-Module command runs successfully. Select the registered repository in the Publish to field, specify the NuGetAPI Key if you are publishing to an online repository like the PowerShell Gallery, then select the Version of the module. This is the minimum information needed to publish your module. Tags: Keywords used to search for modules in PowerShell repositories. License Uri: The URL of licensing terms for the module. Icon Uri: The URL of an icon for the module. Project Uri: The URL of a website for this project. Release Notes: Comments about this version of the module. After filling in the dialog, select Publish to publish the module. Note: The default registered repository is the PowerShell Gallery (PSGallery). A .nupkg file is created when a module is published to a registered repository, which allows you to find the published module when performing a search. If you write a PowerShell module, chances are you’ll want to publish it. Creating excellent PowerShell modules is one thing, but sharing them with others takes them to a whole new level! We hope you find this new PowerShell ModuleManager feature useful. 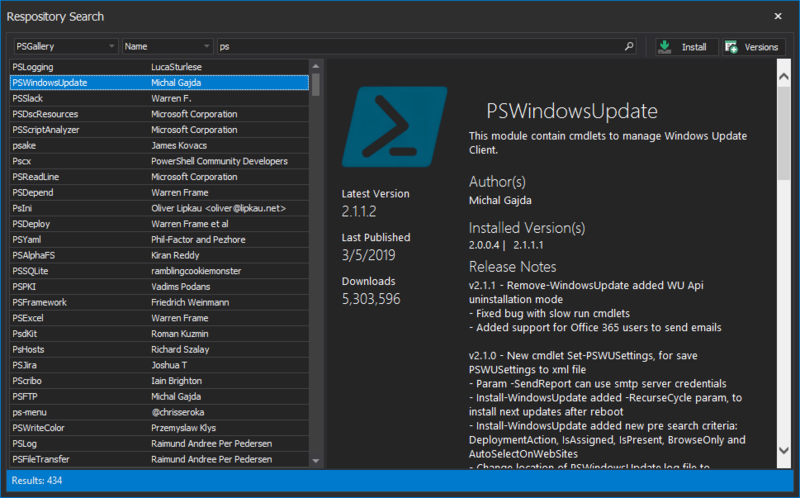 You will need PowerShell ModuleManager 2019 1.1.1 or later to use the new publish functionality. You can view the complete service build log here.